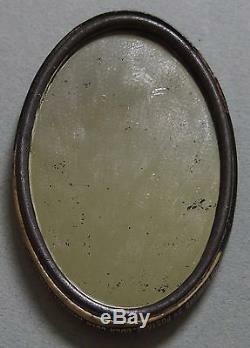 HERE'S A VERY RARE EARLY ORIGINAL 1906 COCA COLA ADVERTISING CELLULOID POCKET MIRROR. 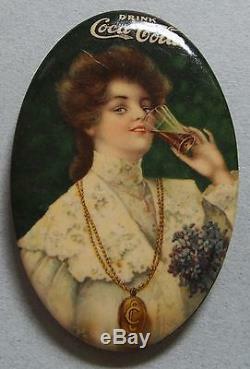 GREAT GRAPHIC OF LOVELY GIRL HOLDING A GLASS OF COKE. IT MEASURES 2 3/4"X 1 3/4" AND IS IN NEAR MINT CONDITION, JUST A FEW "SPECKS" OF SILVERING LOSS ON THE MIRROR, THE FRONT DISPLAYS MINT WITH BRIGHT, VIVID ORIGINAL COLOR AND IT SHINES. THE MIRROR HAS INFO ON THE BOTTOM OF THE CURL ON HOW TO GET ADDITIONAL MIRRORS. WE ALSO HAVE THE REST OF THE "SET" OF THE PRE 1920 COKE MIRRORS. SEE THE PICTURES TO JUDGE THE CONDITION AND ARTWORK FOR YOURSELF. THE PRICE REFLECTS THE RARITY AND CONDITION OF THIS MIRROR. THEY WILL BE LISTED INDIVIDUALLY AND OTHER THAN SOME "SPOTS" OF SILVERING LOSS ON THE MIRRORS THE FRONTS ARE ALL IN MINT CONDITION. TAKE A MINUTE TO VISIT OUR STORE FOR MORE EARLY QUALITY ADVERTISING ITEMS FOR SALE. The item "VERY RARE 1906 COCA COLA CELLULOID ADVERTISING POCKET MIRROR BEAUTIFUL GIRL MINT" is in sale since Tuesday, May 2, 2017. This item is in the category "Collectibles\Advertising\Merchandise & Memorabilia\Mirrors". The seller is "antiqueadvertizing" and is located in ADVERTISING FROM ALL OVER THESE . This item can be shipped worldwide.